Three rotary switches for input selection, volume control, and balance control and many resistors are stored in the printed circuit board. It is a rotary switch for input selection, for volume control, and balance control to the order from the left. 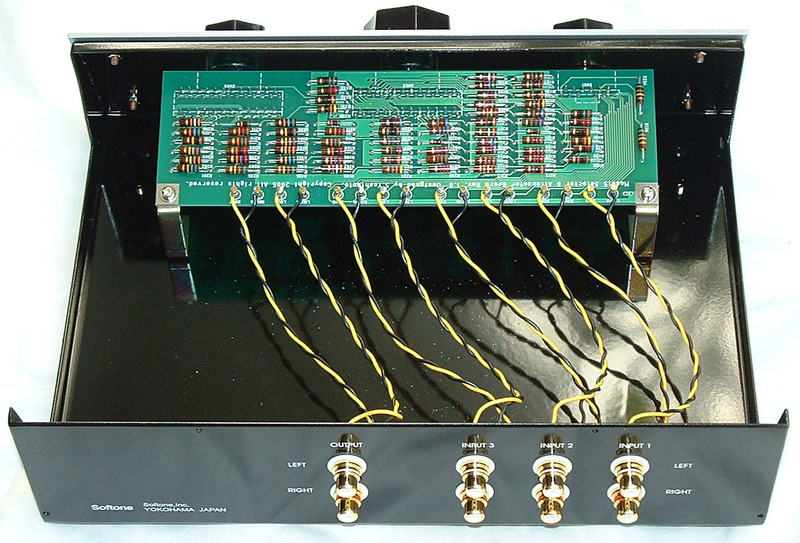 Model5 uses the circuit which a music signal passes only two resistors in every position of volume and balance control. The prototype of a circuit is shunt type attenuator of the following figure. The audio signal inputted from IN is divided by Resistance R and the resistance selected with a rotary switch. Since resistance is small towards a No. 1 terminal from the No. 23 terminal of a rotary switch at order, the volume of the audio signal which appears in OUT can also be adjusted by becoming small towards a No. 1 terminal from a No. 23 terminal. In Model5, balance control is performed by changing upper R resistor further. Balance control is performed by switching the upper resistor. Since the terminal of less than No. 12 is tied mutually, an output is not decreased even if it switchs to the terminal of less than No. 12. Since the higher resistor is connected to the terminal of more than No. 12 by order, an output is decreased, so that it switchs to the terminal of more than No. 12 by order. Since resistance arrangement of balance control is symmetrical by the channel on either side, when one channel declines, the channel of another side is not decreased. This system can perform volume and balance control only by passing along two resistors by any positions. Passage loss and attenuation ratio on each point of volume control are as follows. In order to pass the resistor for balance control, there is 3dB loss in the maximum volume position. Twelve positions of the first half are decreased to 2dB unit, and it decreases to 3dB unit the second half. The attenuation ratio from the center position of balance control is as follows. A right-and-left channel is symmetrical in the center position. The input-and-output impedance of Model5 changes with the position of volume and balance control. Input impedance is 10K ohms the minimum. Output impedance is 20K ohms at the maximum. It is satisfactory at all to use.